An independent consultative group to find the best way to deal with the legacy of the Troubles has been announced by NI Secretary Peter Hain. 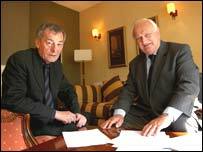 The group will be co-chaired by Denis Bradley, who was vice chairman of the Policing Board, and former Archbishop of Armagh, Lord Eames. Lord Eames said it was "hugely important for the future to deal properly with the past". He said collective memory could affect a whole community. "Memory is a very precious thing on a personal basis," he said. "A collective memory can dictate your future and can sour an entire community. "I just hope and pray, and pray earnestly that what we are going to do will help to put that into its proper prospective." Denis Bradley said it was proper to consult relatives of victims. "You cannot resolve sombody's death, they are dead and there is grief and there is hurt and that will be there for forever," he said. "But it's decent sometimes to ask, what do you think?" 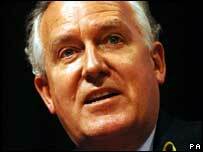 Peter Hain said the government could not tell the people of Northern Ireland how they should deal with the past. "Only the people themselves can try to answer that question," he said. "This consultative group provides a platform for people to express their own views on how to address the violent legacy of the Troubles which impacted on so many across all sections of society." The group includes Jarlath Burns, former GAA captain of Armagh, Presbyterian minister Rev Lesley Carroll and Willie John McBride, former captain of the British and Irish Lions rugby team. The other members are James Mackey, former lecturer in philosophy at Queen's University Belfast, Elaine Moore, alcohol and drugs counsellor and David Porter, director of the Centre for Contemporary Christianity in Ireland. Decommissioning commissioner Martti Ahtisaari and South African lawyer Brian Currin, former chairman of the Parades Commissioner have agreed to act as international advisers to the panel. Irish prime minister Bertie Ahern welcomed the news. "We have an unprecedented opportunity now to lay the foundations of a peaceful, prosperous and shared society on this island for the generations to come," he said. "We owe it to so many people, who were lost, or lost those they loved, to seize this moment and build that future." However, Sinn Fein's Francie Molloy claimed the government would have the final say on any recommendations made. Mr Molloy said: "Inevitably serious concerns do and will arise from the fact that the group is appointed by the British government and will report back to the British government which will have the final say on any recommendations." DUP East Londonderry MP Gregory Campbell said: "This group must not fail to take account of the fact that there were thousands of people in Northern Ireland, irrespective of religious affiliation, who were entirely innocent and yet either were severely injured or killed. "There were others who although they suffered also did so while carrying out illegal terrorist acts." The Alliance Party's Stephen Farry said: "It is critical that the British and Irish governments, and in particular our new devolved administration, act on the recommendations that will eventually follow."